Not long ago I got the opportunity to sign up to review Shepherd’s Lamb‘s DK weight yarn. 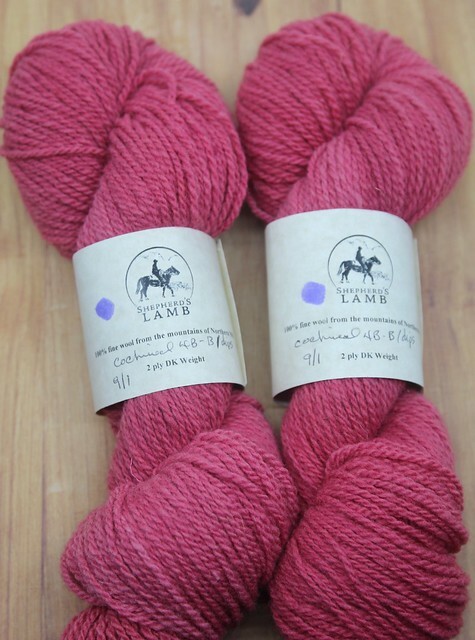 Shepherd’s Lamb is a family ranch in New Mexico that raises a variety of sheep and produces churro, rambouillet, mohair and other yarns that they then dye using natural elements. I’ve worked with their yarns once in the past, and was excited to try again. This time I selected a DK weight yarn dyed with cochineal that produced a lovely reddish pinky yarn. Shepherd’s Lamb generously sent me two skeins. Each skein is 2oz and 180 yards. 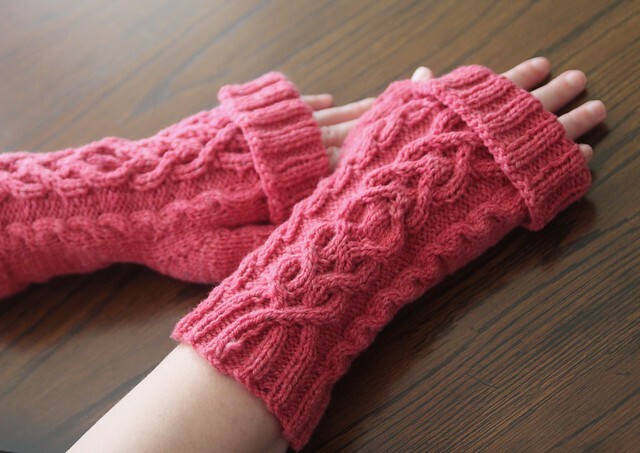 I knew immediately that I wanted to knit fingerless mitts and spend some time combing Ravelry for the perfect pattern. I ended up choosing Dianna Walla’s Weekend Walking Mitts. 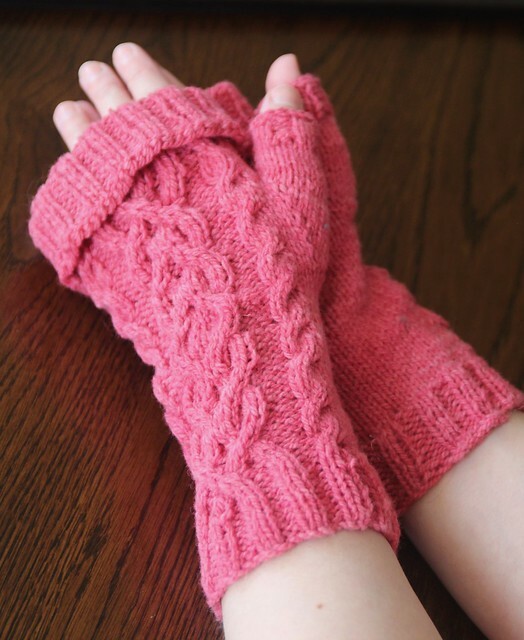 Between the gorgeous yarn and the addictive cables in the pattern, I knit these up in 4 days! I just couldn’t stop knitting and staring at the lovely stitch definition. Capturing the color of these mitts was a little hard. First off – I had to ask my husband to step in and take some photos because it’s very hard to photograph your own hands! Second, in some lights the yarn appears almost red, whereas in others it’s more of a pinky coral. The yarn itself is a little rustic. It is super soft, but also a little sticky, like there is still a bit of lanolin in it. The yarn smells sheepy – not overly so, but just a bit. I can already tell that these are going to be my new favorite mitts! As it turns out, the mitts only took a single skein of the yarn, so I’ve decided to offer up the second skein in a giveaway. Watch my most recent podcast, Episode 233: Spring MKAL, and answer the question I ask in the video in the comments on YouTube and you might win the extra skein! I’ll be recording again on Sunday, March 31st so act quickly! A special thank you to the Shepherd’s Lamb who sent me 2 skeins of DK Yarn (retail: $48.00) for free. I received no other compensation for this review. All opinions and photos are my own. Previous Episode 223: Spring MAL!